This highly engaging half day or one day assertiveness training course, is delivered in-house for your organisation. It offers practical ideas and techniques in the areas ofassertiveness, active listening, confidence, self-esteem and conflict resolution – all crucial aspects to building and maintaining positive, healthy workplace relationships. Conflicts and differences with others are a part of normal everyday life. However, if you have too many, or you are perhaps not handling them well – then life can certainly become stressful. Conflicts at work can be caused by people having different points of view about things such as priorities, responsibilities, or standards – or sometimes conflict can be caused by people trying to achieve what they want at the expense of others. At work and in life, people can react to conflict in different ways. Some people avoid it at any cost – but you can risk being taken advantage of if you become a chronic conflict-avoider. The assertive response involves standing up for yourself and your rights, but doing so in a way that shows respect for other people. Assertiveness does not mean refusing to compromise – it does mean being willing to listen and to have an open mind as to how a fair outcome can be reached. Assertiveness training may be able to provide you with direction in how to handle some of those difficult people and difficult situations that you encounter. And by the way, if you can’t attend an assertiveness course, read on because we also offer an assertiveness e-workbook that can be an excellent guide to support your personal development. Our assertiveness training course is delivered in-house for your organisation in Melbourne, and content includes ……….. If you would like to see some video clips offering ideas on personal development, click on Building Self-Confidence. 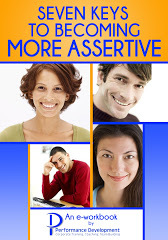 If you don’t have the time to attend an assertiveness course, then you might like to have a look at our e-workbook – which costs only $4.70 and offers an intensive guide to support your personal development …..